left leg - right leg reversal. Left-right arm reversals lead to a negative complex in lead I with a negative P wave in lead I. They are one of the most common causes of right axis deviation on the ECG! Arm-foot switches lead to a very small or 'far field' signal in leads II or III. Chest lead reversals lead to inappropriate R wave progression (increase-decrease-increase) and are often easily recognized. Therefore any right axis or small signal in an extremity lead should be reason enough to check lead positioning. A previous ECG can be very helpful. It is possible to distinguish lead reversal and dextrocardia by watching the precordial leads. Dextrocardia will not show any R wave progression in leads V1-V6, whereas lead reversal will. Right and left arm lead reversal can be distinguished from the (much rarer) dextrocardia by examination of the precordial R wave progression. Right arm and left leg lead reversal. Lead II now measures the signal between the left and right leg, which is remote from the heart. Although not a technical problem, filter settings influence the interpretation of the ECG. 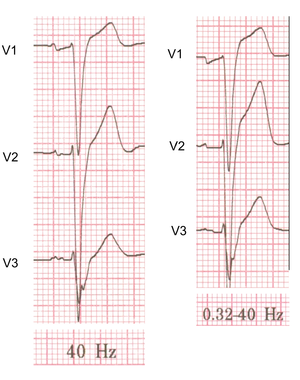 Filter settings can influence the interpretation of ST elevation as these examples show. On the left side an ECG with normal settigns (0.01-40Hz), on the right side a rhythm strip from the same patient with a different high-pass filter setting (0.32-40Hz). Also, the P wave morphology is different between the two ECGs. A high-pass filter reduces low frequency noise. This filter reduces base line drift on the ECG. A low-pass filter reduces high frequency noise, such as produces by chest and extremity muscles and electrical interference from the power grid. Depending on the purpose of the ECG these filters can be adjusted. In the monitor mode the high-pass filter can be set higher at 0.5-1.0 Hz and the low-pass filter on 40 Hz. This is the strongest filter setting (only a narrow frequency range is passed by the filter). This setting is especially useful for rhythm monitoring where noise can be distracting and ST segment interpretation is not very important. In this mode, pacemakerspikes are sometimes invisible while filtered out. In the diagnostic mode the high-pass filter is set at 0.05 Hz and the low-pass filter at 40, 100 or 150 Hz. This improves the diagnostic accuracy of the ST semgent. On the downside a base line drift occurs more easily. Increasing movement artifacts in a Parkinson's patient. The patient was in sinus rhythm (which doesn't show on this short recording)! Baseline drift. The amplifier in the ECG machine has to re-find the 'mean'. This often occurs right after lead connection and after electric cardioversion. Cardioversion from atrial fibrillation to sinus rhythm, with clear baseline drift. Electrical interference from a nearby electrical appliance. A typical example is a 100 Hz background distortion from fluorescent lights. Not to be confused with atrial fibrillation. Another example of an artifact caused by an electrical appliance. The patients rhythm is regular. This strip shows 10 QRS complexes. This page was last edited on 24 April 2013, at 18:57.